Have you ever thought your about how important it is to get your cannabis retail store or medical marijuana dispensary website content to rank well in search results? A local search engine optimization strategy for dispensaries is a super effective digital marketing tactic for any dispensary marketing plan. 2. An increasing number of businesses recognizing the benefits of local SEO. 3. 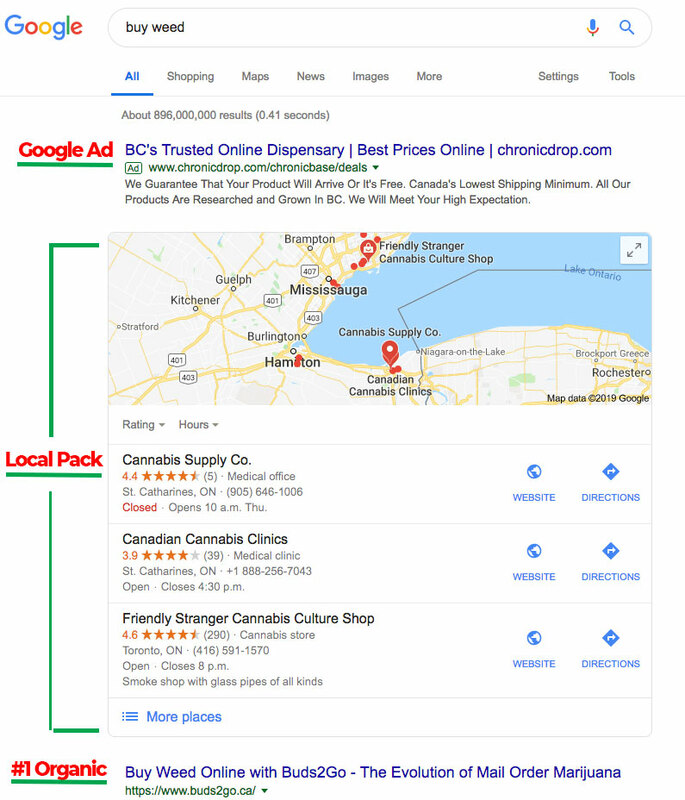 The presence of the Google Local Pack, which shows up on any search for any local business, cannabis retail stores included. What is the Google Local Pack for Dispensaries? You’ve seen the local pack every time you search for a local business, product or service. You may have heard these high-profile local search listings as the “Google Snack Pack”, the “Local 3 Pack” or the “Google 3 Pack”. The Google Local Pack is a boxed-in area that prominently appears on page 1 whenever a local search is made through Google’s mobile or desktop search engines. Google displays the top 3 local business listings most relevant to the search query in this area. It’s important to note that click through from local search traffic for businesses inside of this local pack area is significantly higher than businesses outside of this pack. Google makes it super easy for mobile phone users to find any local business in a matter of seconds. For your marijuana dispensary to get found in search results, you need high-quality content that answers every question your customers have about your products, services, locations and more. This content must be optimized for search engines before being published on your website and formatted for your users so it’s easily consumed by your customers. That’s why dispensary SEO is super vital digital marketing tactic for your marijuana marketing plan. So what are the best marketing strategies to improve your dispensaries local SEO rankings, and how do you get your cannabis retail store to show up in the Google Local Pack with map and link to your location? The following 11 local search ranking factors and SEO tips for medical marijuana dispensaries and recreational cannabis retail stores should be where your focus if you want to improve the local SEO and search results for your local business. One of the first digital marketing tips when opening a new marijuana dispensary is to claim your Google My Business Page. Once you claim this super valuable local search asset, your cannabis dispensary’s business profile appears right on page 1 when people are searching for your dispensary or dispensaries like yours on Google Search and Google Maps. By claiming your Google My Business Page (GMB), you’ve just made it easier to create and update your Google Business Profile so you can stand out, and bring customers in. If claiming your GMB Page is the first marijuana marketing tip when opening your cannabis retail shop, doing the same thing on the Bing search engine has to be the second thing you do. Sure, Google is the world’s largest search engine but did you know that Bing search claims a 33% market share when it comes to search. So you’ll want to optimize your local business’s information, website url, phone number, and locations using Bing Places. Claiming your business and optimizing your business page is one of the easiest and most effective ways to improve your dispensary’s SEO and search engine visibility locally. Believe it or not, choosing the proper category for your cannabis store on Google My Business and Bing Places helps you with your local SEO strategy for your dispensary website. When setting up your GMB and Bing Places accounts make sure you have chosen the correct categories. For best results, use as few categories as possible and make sure they are as accurate as possible. Your GMB and Bing Places category tells search engines exactly what your business does. This is particularly valuable for searchers who are searching for a dispensary close to them. Categories are also relevant if you are trying to rank for a set of targeted and relevant keywords on Google or Bing. Choosing the right categories can positively influence your rank in Google Maps. If you thought the first 3 local SEO tips for cannabis stores were easy, the simplicity of dispensary SEO continues with SEO tip 4. One of the best ways to optimize your GMB and Bing Places business pages is to simply post photos of your dispensary and various locations. Include photos of your marijuana products, your budtenders, and even your happy customers – with permission, of course. Relevant business photos that are posted regularly help to lend credibility to your business and serve as a local ranking signal to search engines. Pro-Tip: optimize your photo’s file name by including the name of your dispensary, the address, and the city in the photo file you upload to GMB or Bing Places. A popular local SEO tactic used by many local B2C businesses for years is having their business information consistently listed on popular online directories. Consistency in your cannabis business citations is important. Make sure your dispensary’s name, address, and phone number (NAP) are the exact same format for all locations. For example, if you use a 1-800 number, make sure you list it as “1-800”, “1.800”, or “800-”, on all online directories, business pages, social platforms, and on your website. If your address is a suite or unit number, be sure you use “Unit XXXX” or “#XXXX” on all online properties including your website. Many local businesses forget about review sites until it’s too late or until they get a bad review on a public website. Once you’ve claimed your business pages on search engines and your business in online directories, your next step is to claim your dispensary’s listing on popular review websites. When you claim your business’s listing on these review sites you’re able to control how you respond to good reviews and bad reviews. Here’s the deal with online customer reviews. Yes – they absolutely will help with your local dispensary SEO strategy and local search rankings. Obviously, there are many SEO factors involved in search rankings but the bottom line is this: online customer reviews can be a strong signal to search engines that communicates relevance, authority, and trust – the 3 most important search ranking factors. Pro Tip: Customer reviews directly on Google will carry the most weight in your local dispensary SEO strategy than any other popular review site. The challenge for your cannabis retail store is to work closely with your budtenders and other customer service reps to ensure that the majority of your reviews are positive. According to Google high-quality reviews improve your business’ visibility in local search engines and can place you in the Local Pack for local searches for dispensaries. You’re able to acquire real testimonials from real customers that you can use in your dispensary’s social media marketing plan. You’re able to better understand your customers, what your dispensary is doing right and/or wrong as a local business. This information can help you get more positive reviews if you use it effectively. You’re able to improve the visibility of your cannabis stores on search engines like Google and Bing. More visibility leads to more website traffic and more in-store foot traffic. If you didn’t know that an engaging social media presence helps your dispensary’s SEO and search rankings you’re about to find out how and why. Social profiles for local dispensaries can and will show up in local search results if your profiles are optimized and have a decent engagement rate. Another bit of SEO magic that can develop from your dispensary’s social media marketing strategy are “social signals”. Google pays close attention to social signals because they provide the search algorithm with details on what users are talking about and what topics are most relevant for what search queries. Social signals indicate that your brand is being talked about by consumers, and this improves your SERP ranking because search engines view social signals as trusted “recommendations”. Your dispensary marketing plan should include a Facebook Business Page, and Instagram Business Page, and a LinkedIn Business Page. I’d also recommend having an active presence on Twitter and YouTube if you have the internal capacity. If not, you should consider outsourcing our social media management to an experienced cannabis marketing company. An often overlooked local SEO factor is the customer’s experience when on your dispensary website. This is typically called user experience (UX). A mobile responsive website that displays exactly the same on desktop, tablet, and smartphones is pretty much the standard for any business website today. Over 51% of smartphone users have discovered a new company or product while conducting a search on their smartphone. (Google, 2018). Bottom line, make sure your cannabis retail store website provides a seamless user experience on all devices, particularly on smartphones. If you sell products and/or take any personal information using forms on your website, your website must be on a secure HTTPS server with a functioning SSL certificate. An HTTPS server, or Hyper Text Transfer Protocol Secure, is the secure version of HTTP, the protocol over which data is sent between your browser and the website that you are connected to. The ‘S’ at the end of HTTPS stands for ‘Secure’. It means all communications between your browser and the website are encrypted. Typically, SSL is used to secure credit card transactions, data transfer, and logins, and more recently is becoming the norm when securing browsing of social media sites. 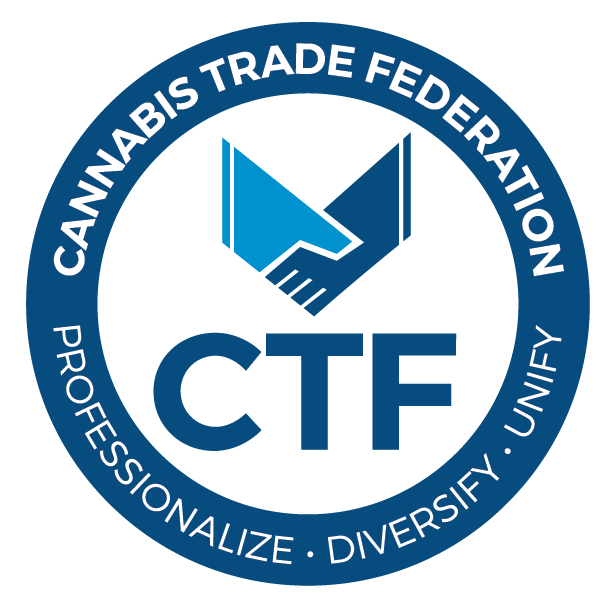 Bottom line here is that if you own or operate a cannabis retail store and have a website, make sure your site is on a secure HTTPS server with an SSL certificate implemented. Having your site on a secure server helps your SEO by boosting your trust score with Google. Google feels comfortable ranking HTTPS websites because they know those are secure websites. I’m saving the best dispensary SEO tip for last. If your website and site code aren’t optimized with a comprehensive SEO and keyword strategy you should really consider getting this implemented asap. People are searching for information on cannabis, recreational marijuana, dispensaries near them, and many more cannabis-related topics. They search using Google and Bing – not Facebook and Instagram. A comprehensive SEO and keyword strategy helps your dispensary be found in local search results and regular search results for a targeted set of relevant and profitable keywords. You’ll need an experienced cannabis SEO strategist to help you with in-depth keyword research to find relevant and popular short-tail, long-tail, and semantically related keyword search phrases and search queries. Comprehensive keyword research (short-tail long-tail, semantically related terms). Optimization of on-page location data and keyword strategy. Optimization of all page titles and meta descriptions. Optimization of all website images including file name, file size, alt attribute, title attribute, and description. In-depth blog content creation and blog SEO including relevant localized content with backlinks. I’m hoping you’ve realized how important an SEO strategy for cannabis stores is to your marijuana dispensary business. The dispensary SEO tips discussed in this article will help your website show up in local search results if implemented correctly and with a relevant, popular keyword strategy. With the strict advertising restrictions surrounding cannabis promotion and marketing, having your website content found online for relevant search queries is one of the most effective ways to market and promote your dispensary.